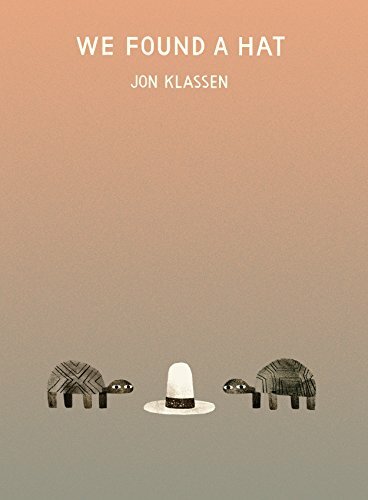 Jon Klassen returns with the third installation of the Hat trilogy. Previously Klassen won a Theodor Seuss Geisel Honor for the first of the series I Want My Hat Back and a Caldecott Medal for This Is Not My Hat. All three are targeted to the preschool and very early readers audience and are sure to find homes on a shelf in every classroom. Klassen is no stranger to illustration. Having contributed to other award winning projects with Mac Barnett, Lemony Snicket, and Caroline Stutson, he is breaking new ground here with his own author-illustrator endeavor. He has a distinctly dry humor and subtle wit and has created an interesting and amusing, if not overly simplistic, view on a number of potential topics: friendship, loyalty, honesty, stealing, justice, to name a few. We Found a Hat is told in three parts. In the beginning, two turtles, differentiated only by the line pattern of their shells, find a hat. One hat. One hat that looks a little too much like the Man-With-the-Yellow-Hat hat in the beloved Curious George series by Margaret and H. A. Rey—with the exception that Klassen’s hat is white. Nevertheless there are two turtles and only one hat, which presents a problem because both turtles like the hat. They see no other solution but to abandon the one hat reasoning that because they both can not have the hat, neither should have the hat, resolving to “leave the hat here and forget that we found it.” Which is easier said than done. With part two comes the sunset. Bedtime. But one turtle cannot rest; he is thinking about the hat. Even though he said he was thinking about “nothing,” his eyes betray him, he is thinking about the hat. For those familiar with the endings of the first two books, part three will bring something different. Following the theme in the previous stories, one half expects one turtle to eat the other in order to have the hat for himself; however, this is not the case, and we find a sweet and sensitive ending. Although sweet and sensitive it may be, one can’t help but wonder at the message the ending is sending to the little readers. The ending feels almost wrong, a bit too easy, too happily ever after but only in my dreams. Was there no way to share the hat? Take turns? Could it have been more clever, funnier, wittier, quirkier?